If present, remove giblets from Cornish hens. 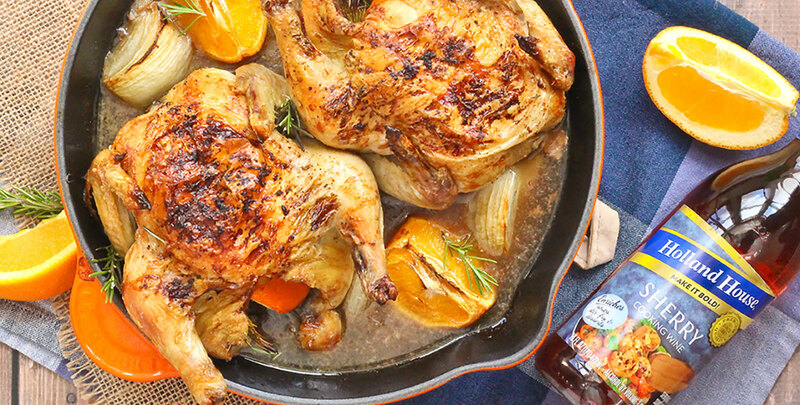 Rub outside of Cornish hens with 1 Tbsp. of the olive oil. Season hens with salt and pepper on all sides. Place 1 orange wedge and 1 sprig of rosemary in cavity of each Cornish hen. Arrange in a roasting pan and then place remaining orange wedges and quartered onions around hens. Roast at 450°F for 25 minutes. Reduce oven temperature to 350°F. In a small bowl or measuring cup, whisk together Holland House® Sherry Cooking Wine, chicken broth, mustard, and remaining 1 Tbsp. of oil and pour over hens. Continue roasting about 45 minutes longer, or until hens are golden brown and juices run clear and an instant-read thermometer inserted into the thickest part of the thigh registers 180°F. Baste with juices from pan every 10 minutes. Transfer hens, oranges, and onions to a platter, pouring liquid from cavities into the roasting pan. Cover Cornish hens loosely with aluminum foil to keep warm. Transfer pan juices to a medium saucepan (you can also do this right in the roasting pan) and place over high heat. Boil until all liquids reduce to a sauce, 5-7 minutes. To serve, cut hens in half lengthwise and arrange on plates. Spoon sauce over hens and serve. Bold Boost #7: Add 2 Tbsp of Holland House® White with Lemon Cooking Wine to your fish before grilling to get a flavorful finish.